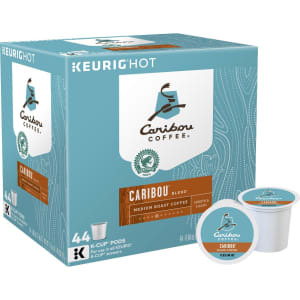 Caribou Coffee Caribou Blend Keurig Single-Serve K-Cup Pod, Medium Roast Coffee, 44ct from Target. ties. Caribou Blend begins with a satisfying heaviness on your palate. Expect a big-bodied, syrupy taste with a clean, snappy finish of savory bittersweet chocolate. Caribou Blend is an inspired merging of sweet, spicy and berry notes for a smooth, relaxing, down-to-earth cup. A cup of Caribou Blend is perfect for any time of the day!